After weeks of international observers speculating about the impact on China of the election of Donald Trump as the next American president, the Communist party’s flagship (and authoritative) newspaper People’s Daily has begun to weigh in on what it means— for the future of the United States, perhaps for Sino-American relations. The delay in publishing an official reaction is interesting in itself, indicating that consensus on Trump’s victory is proving difficult to achieve in China’s leadership circles. Contrary to the views of many analysts outside China, there’s no preferred view visible yet here, certainly no conclusion reached by China’s leaders about how relations between Beijing and Washington will be impacted. Outside China, there are understandable anxieties about how the election of Donald Trump will play out to be sure; but many of the deductions aren’t so much suppositions as projections--people dismayed by the outcome of the American election and thinking that Beijing will surely take advantage of results that the writers themselves find repugnant. Inside China, matters are more complicated--far more complex than many international observers are rendering them. What’s important where People’s Daily is concerned is that it has an exhaustive vetting process where writers are concerned, seeking out officials and official scholars whose views that can best reflect leadership thinking and unresolved debates. That’s because Chinese commentators remain reluctant to write much that hasn't been approved or at least sponsored by certain authorities. 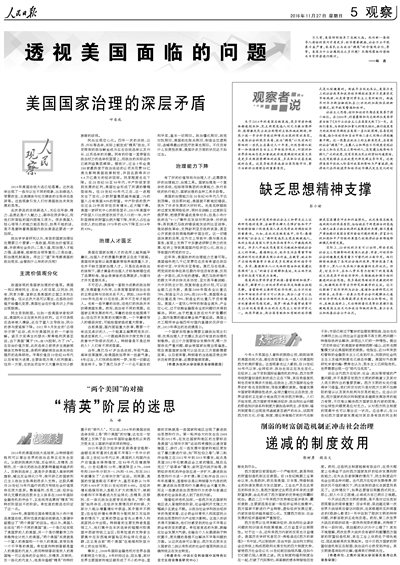 It’s silly to think that President Xi Jinping is overseeing such publications personally, because that’s not how the Chinese political system operates; bureaus and departments, retired officials and various scholars—each and all will seek to have their views aired in print or online instead of simply privately, and they find support far lower in China’s political food chain. But it’s not foolish to assume that the dearth of official essays up to this point about what Trump’s election means for China indicates that there’s simply been no strong consensus about that event’s implications for Beijing’s policy towards the United States. And it’s that situation which may be shifting with the publication of 4 essays this past Sunday in People’s Daily. 2 scholars and 2 commentators wrote the essays. There’s nothing explicit connecting the authors to any particular part of the Communist party, and so it’s likely that their musings are indicative of what has been agreed on (perhaps just for the moment) before a more authoritative message is fashioned under a more recognizable pseudonym that would indicate unified thinking in the Chinese leadership. There are some striking commonalities across these commentaries. First, the authors see the United States as becoming more divided as a society, as a more elitist culture was taking shape, wealth was becoming a more prominent value, and the income gap was becoming sharper. Ye Xicheng of Peking University writes that “from the 1950s and into the '90s, the middle class [in the US] enjoyed the dividends of development...But after the 1990s, this process has changed, a small number of income groups are getting richer…The assets of the middle class have not grown and have fallen sharply over the past two decades.” “Two Americas” have been created, according to Ma Feng, an academician at the Chinese Academy of Social Science--“the elites” and everyone else. Because they’re good Marxists, the authors of all of these essays see the economic forces of capitalism producing social disunity leading to a distrust of change managed from above. For example, the “insistence on a single and narrow view of the liberal market economy,” as Peng Xiaoyu frames it, aims at wealth rather than equality, and ends up undermining “spiritual support” for the US political system as a whole, as well as socialism as an alternative program. Americans, in this view, had nowhere to turn except to take a chance on Trump. The result of this economic disparity is cynicism that is, in the view of the various authors’, producing a crisis in governance in the United States. Ye argues that while “America's governance capacity almost peaked in the 1990s…since then, the United States has been making mistakes and losing many good opportunities for development.” Those errors are, at least according to Ye, the result of poor leadership, declining talent in the civil service, and ineffective mechanisms by which to govern what’s become a more complex (i.e., diverse and declining) country. Other authors in this collection echo this assessment, with a co-authored piece by Guo Shuyong and Cheng Yawen insisting that “as the mechanism of wealth creation is weakening, the political operation [of the United States and other similar systems] will inevitably be affected”—that is, Western democracies as a whole are slipping and their economic problems are hampering the capacity of their governments to actually govern. None of the authors here can resist hitting out at what they see as the decline of American power overseas. For example, Ye contends that Washington has wasted precious resources playing the hegemon unsuccessfully in Iraq, Syria and elsewhere, while Ma writes that Trump’s victory is another example of “radical political ideas and behavior winning social support”, in part because positive views of the United States abroad have largely evaporated. Democracy—or at least its Western version—may not be dead, but according to these Chinese commentators and their colleagues intoning on the pages of People’s Daily, it’s clearly dying. Taken as a whole, these essays don’t provide much evidence of an abrupt shift forthcoming in Beijing’s approach to Washington. Indeed, the eulogy being sung here for United States is the same disharmony we’ve heard chanted about before: that America (where more than a few Chinese officials send their children to study and live, and purchase property) is chaotic, drifting, corrupt, and in decline. 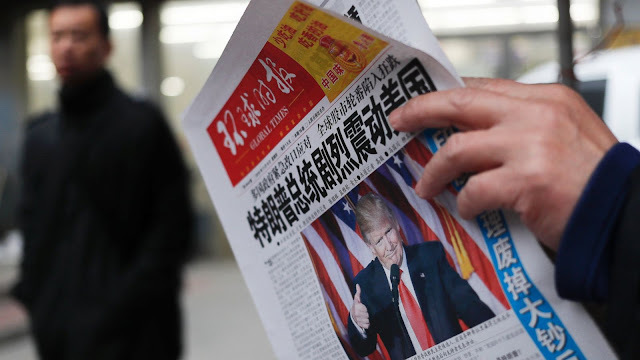 For many of China’s official commentaries, these have been the traditional lyrics for some time—and Donald Trump’s election is simply another sign that the United States is finding the wrong rhythm all by by itself. So if the views expressed in these essays turn out to be mainstream thinking in the Chinese leadership, the status quo in Sino-American relations may yet remain so for some time. This isn’t the first or only moment in these essays when comments and critiques by the authors about the United States could be easily mistaken for (or are used to mask) concerns about China itself.